Advantech - industrial computer , embedded computer, industrial automation, industrial motherboard, network security appliance, digital video surveillance, panel PC, industrial IO. MyAdvantech is a personalized portal for Advantech customers. By becoming an Advantech member, you can receive latest product news, webinar invitations and special eStore offers. Sign up today to get 24/7 quick access to your account information. Find the latest Advantech application stories here! Find the latest Advantech videos here! The most important element in IoT solutions is data acquisition. 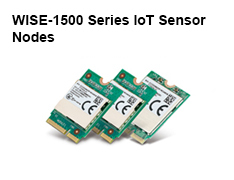 To help System Integrators (SI) easily and quickly build wireless IoT environments, Advantech provides scalable sensor node solutions for data acquisition. 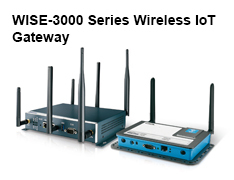 Designed with a wide range of integrated wireless network management and cloud connectivity platforms, combined with our WISE-PaaS IoT software, Advantech products provide everything from sensors to cloud-based wireless IoT solutions. Extreme Low Power: Industrial-leading low power consumption. Multiple Sensor Combination: Temperature, humidity, water, gas, structural integrity, etc. Wide-temp Design: Indoor, outdoor and rugged design for different environmental needs. Complete Software Support: SDK includes WSN API, device management API, data management API. As an industrial leader, Advantech developed the M2.COM open standard to empower more IoT applications. M2.COM is a sensor platform based on a simple modular design that provides a solid, standardized solution for IoT sensor nodes and sensors. 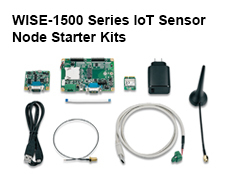 Advantech WISE-1500 series support all the necessary software stacks to build up IoT sensor devices. The ARM mbed or RTOS forms the foundation of the embedded microprocessor operating system, with supporting multiple IoT communication protocols including LWM2M, OSGI, AllJoyn and MQTT. Data can be quickly and easily acquired and transformed into different formats to communicate with WISE-PaaS or other cloud services. 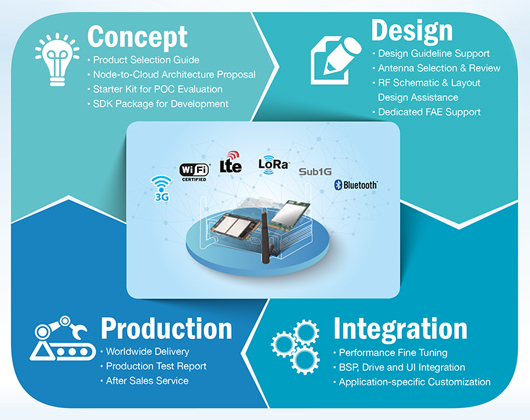 Advantech Wireless design-in service provides design and integration assistance from concept to final production, helping customers achieve faster time to market with lower development complexity and minimal integration cost. 1.Concept : Advantech offers a wide range of wireless services to help customers’ vertical markets applications. With starter kit and SDK, customers can quickly build proof of concept products to verify their application. 2.Design : After the validation of PoC products, Advantech provides customers with design guidelines and antenna selections. Once the design is completed, Advantech offers technical reviews to improve the schematics and RF design so customers benefit from the reduced risk of new product launches. 3.Integration : Advantech also offers customization services based on your specific application requirements. 4.Production : Advantech offers worldwide delivery and after sales service. Visit the Advantech Global website, or choose your country or region below. © 1983-2019 Advantech Co., Ltd.